Imagine an everyday world in which the price of gasoline (and oil) continues to go up, and up, and up. Think about the immediate impact that would have on our lives. Of course, everybody already knows how about gasoline has affected our driving habits. People can't wait to junk their gas-guzzling SUVs for a new Prius. But there are more, not-so-obvious changes on the horizon that Chris Steiner tracks brilliantly in this provocative work. 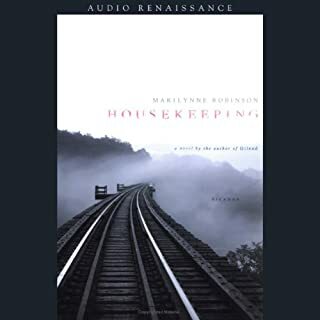 I have been following this topic and am very glad to have an audio book on the subject. And there is some good stuff here. The concept for organizing the book is clever. And some of the overall thoughts on our future are interesting as well. BUT the book is not a great read. The writing is very inefficient. The author takes a long time to make his points, going into many exhaustive and unnecessary stories, perhaps under the mistaken notion that non-fiction must be colored up to be interesting. The whole book could have been 1/3 as long or less. I also think that Steiner paints a somewhat preposterously smiley face on a ominous future. I wholly agree that, ultimately, a low energy future will be better than what we have now. But getting there from here is another matter. It may well be that mankind will lose billions of people in the change. That won't be happy. 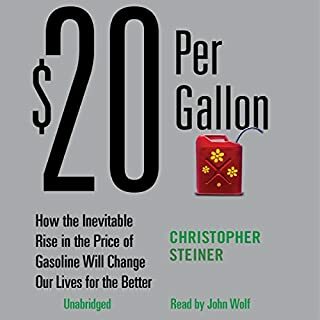 Steiner also fails to discuss the gravity of the link between fossil fuel and the economy. It seems evident to me, or at least obvious enough to discuss, that the boom of modern society since the industrial revolution (and the resultant boom in population) has been the result of our ability to find and use fossil fuel. Once this one time "gift" starts to wane, won't the economy and population and the very complexity of society wane as well? We might be on the verge of an very long contraction of industry. The economy may never "recover." Many of us may have no job prospects except to grow food. Not all of this is bad, but certainly warrants examination and discussion, I would think. And none of it will likely be easy. I'm not sure why Steiner wrote this book in this way. Is he trying to reassure us so we are not afraid to take action? Is it all a masked attempt to promote nuclear power? Is he just a very optimistic guy? Beats me. Still, there's little else on audio and this is worth the read. I've seen this movie, read the print novel, and now heard this. I haven't yet found a way into Gilead, but this book is sweet genius. I would comment on the theme, but this is so rich, I'm not sure if one can speak of a theme for this story anymore than one can of a poem or song. This is pure art, but easy to follow. It has something to do with how we manage ourselves and our lives, or how we may not. I'd love to know the origin of this story. It's hard to imagine how it was imagined. I have read nothing more beautiful and powerful. The imagery of her language is reason enough to listen, and that's just the beginning of this masterwork. 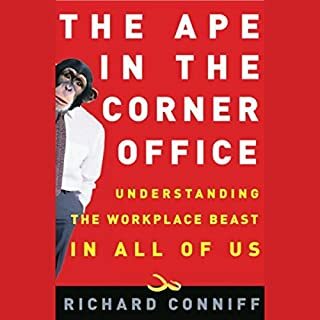 The Ape in the Corner Office connects with the day-to-day of the workplace because it helps explain what people are really concerned about: How come he got the wing chair with the gold trim? How can I survive as that big ape's subordinate without becoming a spineless yes-man? Why does being a lone wolf mean being a loser? And, yes, why is it that jerks seem to prosper, at least in the short run? I've been on a run of great sociological reads from Audible. Blink, Wisdom of the Crowds, Freakanomics, and Tipping Point. I recommend all of these titles highly, and this one after those. There is a slightly smug, and slightly overreaching play at humor throughout this book which I find unnecessary and diminishing. The narrator unfortunately echos this tone with a slight smug smile in his voice. But otherwise it is solid. There are some good takes on our animal nature, and the topic is great. There is also an unnecessary reach to make this a "useful" text, with business applications. This feels hollow and possibly due to editorial influence. With Malcolm Gladwell, it feels natural, and probably part of his background, but doesn't work here as well. Still, it is a worthwhile read. and the "conclusions" included favor humanity, and so tolerable. Lily Owens has shaped her entire life around one devastating memory - the day her mother was killed. 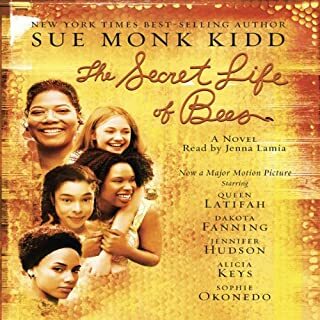 When she and her "stand-in-mother," a fierce-hearted black woman named Rosaleen, are taken in by an eccentric trio of black beekeeping sisters, Lily enters a secret world of bees and honey, and of the Black Madonna who presides over this household of strong, wise women. I don't get why so many love this book. My wife read it and loved it too. But my listen left me waiting for it to take off. Perhaps it is a book that is better suited for women? I just did not get absorbed. I never was anxious to get back to it. I'm sort of surprised I finished it. I just kept waiting for something captivating to happen. I'm still waiting.